Award-Winning Taiwan director Liwei Chiu takes young viewers around the globle to wintness the effects of climate change. It’s sometimes difficult to think and talk about “green issues”without thinking about difficult concepts like ecology and our ecosystem. Studying science can be considered a boring activity for some people, especially grade-schoolers. Perhaps parents and teachers can first take a simple step by reminding children to switch off lights, fans and electronic equipment when they are not in use.This forms a good habit in the long run for everyone in the household.To reinforce this habit, kids can also watch “Weather Boy” (觀測站少年),the first Made-in-Taiwan anime to address environmental issues such as the greenhouse effect and volcanic activity in plain words for young learners. Directed by Liwei Chiu (邱立偉), the inspiring cli-fi animation movie made of 13 episodes totaling 283 minutes takes young viewers around the globe to witness the effects of climate change. Taking Action to Protect the Earth Broadcast last month on Taiwan Public Television Service (PTS, 公視),“Weather Boy” centers on Jamie, a young boy who follows his father, a weather scientist from Taiwan, to a meteorological observatory in Switzerland.At the station, they embark on a whirlwind journey through space and time in which the results of climate change are laid bare. 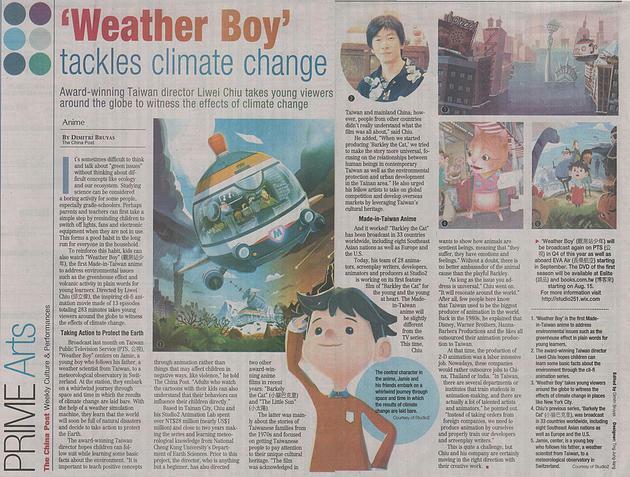 With the help of a weather simulation machine, they learn that the world will soon be full of natural disasters and decide to take action to protect the Earth.The award-winning Taiwan director hopes children can follow suit while learning some basic facts about the environment. “It is important to teach positive concepts through animation rather than things that may affect children in negative ways, like violence,” he told The China Post. “Adults who watch the cartoons with their kids can also understand that their behaviors can influence their children directly.”Based in Tainan City, Chiu and his Studio2 Animation Lab spent over NT$28 million (nearly US$1 million) and close to two years making the series and learning meteorological knowledge from National Cheng Kung University’s Department of Earth Sciences. Prior to this project, the director, who is anything but a beginner, has also directed two other award-winning anime films in recent years: “Barkely the Cat” (小貓巴克里) and “The Little Sun”(小太陽).The latter was mainly about the stories of Taiwanese families from the 1970s and focused on getting Taiwanese people to pay attention to their unique cultural heritage. “The film was acknowledged in Taiwan and mainland China; however,people from other countries didn’t really understand what the film was all about,” said Chiu.He added, “When we started producing ‘Barkley the Cat,’ we tried to make the story more universal, focusing on the relationships between human beings in contemporary Taiwan as well as the environmental protection and urban development in the Tainan area.” He also urged his fellow artists to take on global competition and develop overseas markets by leveraging Taiwan’s cultural heritage. Made-in-Taiwan Anime And it worked! “Barkley the Cat”has been broadcast in 33 countries worldwide, including eight Southeast Asian nations as well as Europe and the U.S. Today, his team of 28 animators, screenplay writers, developers, animators and producers at Studio2 is working on its first feature film of “Barkley the Cat” for the young and the young at heart. The Madein-Taiwan anime will be slightly different from the TV series. This time, Chiu wants to show how animals are sentient beings, meaning that “they suffer, they have emotions and feelings.” Without a doubt, there is no better ambassador of the animal cause than the playful Barkley.“As long as the issue you address is universal,” Chiu went on.“It will resonate around the world.”After all, few people here know that Taiwan used to be the biggest producer of animation in the world. Back in the 1980s, he explained that Disney, Warner Brothers, Hanna-Barbera Productions and the likes all outsourced their animation production to Taiwan. At that time, the production of 2-D animation was a labor intensive job. Nowadays, these companies would rather outsource jobs to China, Thailand or India. “In Taiwan, there are several departments or institutes that train students in animation-making, and there are actually a lot of talented artists and animators,” he pointed out.“Instead of taking orders from foreign companies, we need to produce animation by ourselves and properly train our developers and screenplay writers.”This is quite a challenge, but Chiu and his company are certainly moving in the right direction with their creative work.